We sell fully customised lecture notepads custom printed with your unique designs. We deliver notebooks in bulk all around Australia. Produced in Australia with the best quality and fastest delivery times possible. 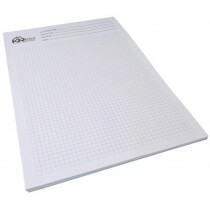 Choose between A4 and the smaller A5 sizes and get notepads that suit your marketing needs. Our notebooks come delivered with 80gsm weighted paper. Whether you require journals for a promotional show or simply as a handout product for a university or fundraising event, our custom printed units are an excellent choice. Get them printed with lines and a logo or uniquely imprinted with more elaborate designs. These are great gifts your recipients will enjoy using on a daily basis. Our unique notepads for a variety of purposes including Office Stationery | Event Giveaway | Hotel Notepaper | Expo Marketing Items | Promotional Gifts Conferences | and so much more! If you desire, we can print notepads cheaply with a single colour print, or we can supply full-colour custom printed notepads with photos or images. The custom printing is done on every page of the notebook. 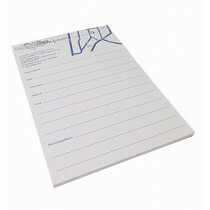 Our notepads are available with recycled paper. 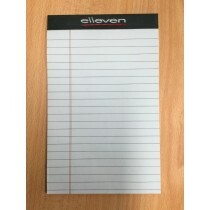 Please add 15% to the total price for promotional notepads, supplied with eco-friendly recycled paper. All our notepads come delivered with a brown strawboard (cardboard) backing. The support backing is attached to the rear of the notepad. 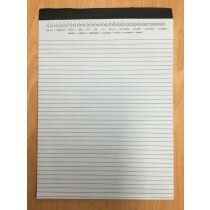 This backing sheet provides the notepad with many advantages, including stability and protection for the notepad against bending or creasing. 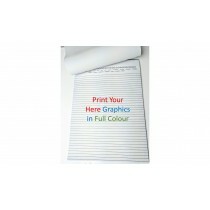 All our notepads are delivered in your choice of, 10, 25 or 50 pages per pad. If you desire additional pages, please contact us for a quote.